All businesses are down these days instead of branded lawn suits by designers. Back to back all fashion houses and manufacturers presenting their new spring summer dresses for women. Pakistani designers busy nowadays in organizing various fashion events; get to gather parties and at the Morning shows where they beautifully explain about their new designs, price range and wherever availability is possible and how. IVY spring summer 2015 unstitched dresses are ready for sale now as three piece fabrics. The brand gives catalogue of the dresses where diverse variety of stitching styles that is added to the convenience of IVY customers. Women can select stitching styles from IVY spring summer lawn collection 2015 catalogue or can edit few styles and got their best one and sews this for their spring summer wardrobe. IVY new summer range for the year 2015 is offered in the intact parcel of shirt printed fabric with embroidery on neckline and border area, dyed trouser piece and printed dupatta fabric. To compose best lawn dresses for this year, IVY clothing brand incorporates digital high quality color prints in its spring summer lawn collection for women, the color palette includes mostly natural and gloomy colors like bright yellow, shiny pink, purple, green, parrot, orange, brown, sky blue etc. The brand hires one of the talented and emerging model Humaima Malik as the brand ambassador of IVY spring summer lawn collection 2015. She got fame in Pakistani movie BOL with Atif Aslam and then got offered to work in Bollywood movies. 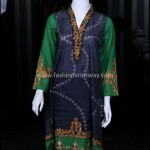 The price range of IVY lawn prints is between PKR 4000 to PKR 5000. You can order your favorite dress through IVY official website and get at your doorstep. 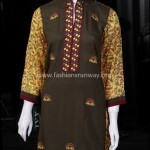 This is not a casual wear lawn prints, females can wear IVY lawn prints 2015 in parties, wedding functions and formally. Check below here newly established fashion label IVY Spring Summer Lawn Unstitched Collection 2015 for ladies.